In December 2016, I published an article on another site of mine called Can You Use Cruise Control While Towing? The object… to provide some sort of definitive answer on the question… considering there are so many “opinions” on the matter. Several days of research were involved in writing the 1200+ words for that item. I managed to locate a range of contradictory sources and somehow managed to make sense of it all! But this week, I noticed a very obvious copy of my original content on a site which covers similar content. 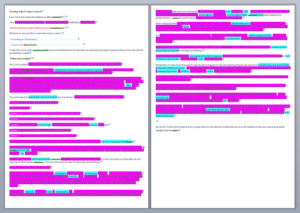 The pic below shows the 1000 words contained in the copy… with the PINK highlight being an EXACT match for 722 words from my article! The blue bits are where the same idea was used… just the words changed around slightly. On contacting them to request a link back since I went to the trouble of writing 72% of his article for him… I got told it was not my work… that they had sourced it from a variety of places! I find it amazing that he reckons he used the SAME sources as I did, and writes in the exact same style as I do!!! Puts plagiarism in another perspective, doesn’t it? What do YOU do to protect your copyright? What’s gonna happen later? Is he going to change the text sufficiently to keep me happy? 1. get his server shutdown? 2. get google to remove their indexed copy? 3. tell Facebook about the plagiarised content in one of their groups? In the meantime, when I get a chance, I’m going to “borrow” the Copyscape logo and place it on a LOT more of my pages for a bit more “bogan” protection!